Jin Ling pulled himself out of the daze. He hesitated for a moment and only whistled after Jiang Cheng shot him two lightning-sharp beams from his eyes. The dog dashed over in just a few leaps. Wei WuXian, body as stiff as an iron board, could only be dragged forward, walking one step at a time. Jiang Cheng found an empty room and threw Wei WuXian inside, closing the door behind him. The dog followed them inside and sat by the door. Wei WuXian had his eyes tightly locked on it, afraid that it would pounce on him at the next possible moment. Remembering how he had been controlled in just a short amount of time, he exclaimed in his heart that Jiang Cheng really knew the best way to deal with him. Meanwhile, Jiang Cheng slowly sat down by the table and poured himself a cup of tea. For a moment, no one spoke a word. The cup of tea was still steaming hot. Without having a single sip of it, he hurled it onto the ground. Growing up, Jiang Cheng had seen Wei WuXian’s awful state countless times as he ran away from dogs. Others may have believed him if he denied it, but, in front of someone who knew him so thoroughly, it’d be impossible to argue. This was an obstacle harder to overcome than Zidian. Remaining seated at the table, he shouted in a commanding way. The dog stood up immediately! Being in the same room as it already made Wei WuXian sweat in uneasiness. Seeing that the large, snarling dog closed in on him in less than a second, his ears were full of its low howls and his entire body numbed. He had forgotten about much of his early years of wandering on the streets. The only things he still remembered was the terror he felt as he was chased by dogs and the slicing pain of teeth and claws digging into his flesh. The fear that had been planted deep within his heart couldn’t be overcome or eased no how he tried. Wei WuXian immediately understood whose name he had unconsciously called out. Yet, he just couldn’t find the right words to put after it. Wei WuXian calmed himself down and searched as fast as he could for a way out of the situation at hand. Although he had always dreamed of returning to Lotus Pier once more, he didn’t want to go back to the tattered one nowadays! “I didn’t want to say it exactly because you kept on scolding me! Are you gonna listen or not? If not, I’m just not gonna say it!” Jin Ling replied in an angry voice. Jing Ling’s word sounded quite believable. However, in Wei WuXian’s ears, all those sentences were nonsense. He knew precisely where Jin Ling was this afternoon. Moreover, if Wen Ning hid himself, unless he summoned him on purpose, there’d be no way that a junior would find him so easily. Jiang Cheng answered, “This isn’t a question you should ask. Remember to watch him properly. If I return to see that he disappeared, I’ll break your leg for sure!” After a few more questions about the exact location, he left with half of the disciples and went to chase the nonexistent Wen Ning. None of the disciples dared to disobey. In a short while, the door had been opened again and Jin Ling stuck his head in, eyes darting around the room. Wei WuXian sat up straight. Jin Ling put a finger in front of his lips, walked in quietly, put his hand on Zidian, then whispered something. Zidian could only work if it recognized its owner. Jiang Cheng had probably allowed it to recognize Jin Ling. The electric currents went out at once, and it transformed into a silver ring embedded with a purple crystal, lying on top of Jin Ling’s fair-colored palms. It wasn’t the first time that Jin Ling was told he had ‘no mother to teach him’, but it was the first time someone apologized to him in such a serious way. With an ‘I’m sorry’ shoved right into his face, he didn’t know why, but he suddenly felt a bit uneasy. Jin Ling was already feeling guilty since he stole Zidian and let Wei WuXian go. Hearing the name, he whirled around to look. Using the chance, Wei WuXian hit Jin Ling’s neck, forming a blade with his hand. He laid Jin Ling flat on the ground, rolled up the bottom of his trousers, and examined the Curse Mark on his leg. He tried a few methods, but none of them made it fade. After a moment, he sighed, knowing that it’d be difficult. However, although there were some curse marks that he was unable to remove, he could transfer them to his own body. Behind him, Wei WuXian laughed so hard that he couldn’t breathe. After Jin Ling disappeared into the distance, his chest itched in a stuffy way, and finally managed to stop the laughter after a while of coughing. Only then, did he have time to think. Wei WuXian was taken home by Jiang FengMian when he was nine. Most memories from back then were already blurred. Yet, Jin Ling’s mother, Jiang YanLi, remembered all of them, and even told him quite a few. She said that, after his father heard of the news that his parents both died in battle, he had always dedicated himself to finding the child that these past friends had left behind. After searching for a while, he finally found the child in Yiling. The first time they met, Wei WuXian was kneeling on the ground, eating the fruit peels that somebody tossed on the ground. Yiling’s winter and spring were quite cold, yet the child only wore thin layers. His knees were already tattered, and on his feet were two different shoes that didn’t fit at all. As he was looking down, searching for fruit peels, Jiang FengMian called him. He still remembered that there was a “Ying” in his name, so he lifted his head. Although his cheeks were both red and chapped from the cold, he still wore a smile. Jiang YanLi said that he was born with a smiling look. No matter what unfortunate thing happened, he wouldn’t cling on to them; no matter what situation he was in, he would be happy. Although it sounded a bit heartless, it really wasn’t bad. Jiang FengMian fed him a piece of melon, and he let Jiang FengMian carry him back. Back then, Jiang Cheng was also around eight or nine. He kept a few puppies to play with him in Lotus Pier. Finding out that Wei WuXian was extremely scared of dogs, Jiang FengMian suggested for Jiang Cheng to send the dogs away. Jiang Cheng was really unwilling. After throwing a tantrum of breaking things, pouting, and bawling his eyes out, he finally sent the dogs away. Although, because of this, he held hostility toward Wei WuXian for a long time, after the two grew familiar, they had begun to cause mischief together. Whenever he ran into dogs, Jiang Cheng would always chase them away, then have a good laugh at Wei WuXian, who jumped onto a tree. He had always thought that Jiang Cheng would be on his side, and Lan WangJi on the side opposite to him. He could never have imagined that things would turn out so differently. Wei WuXian walked toward the rendezvous point that he and Lan WangJi were supposed to meet at. Nobody walked among the sparse lights that flickered in the night. Without having to look around, the white-robed figure stood at the end of the street, standing motionless with his head hung low. 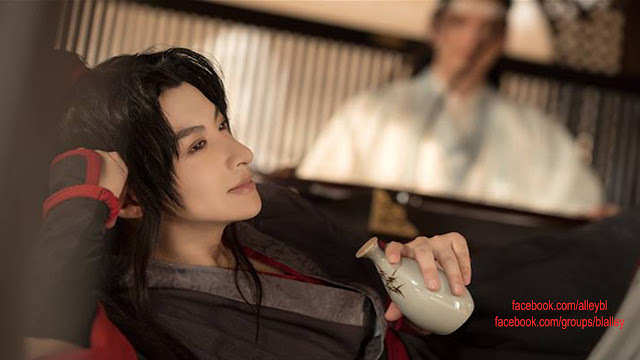 Before Wei WuXian made any sound, Lan WangJi looked up and saw him. After some hesitation, he walked over with a darkened expression. Wei WuXian didn’t know why, but he involuntarily took a step backward. He could almost see scarlet streaks of blood by the corners of Lan WangJi’s eyes. He had to admit… Lan WangJi’s face really did look quite scary.